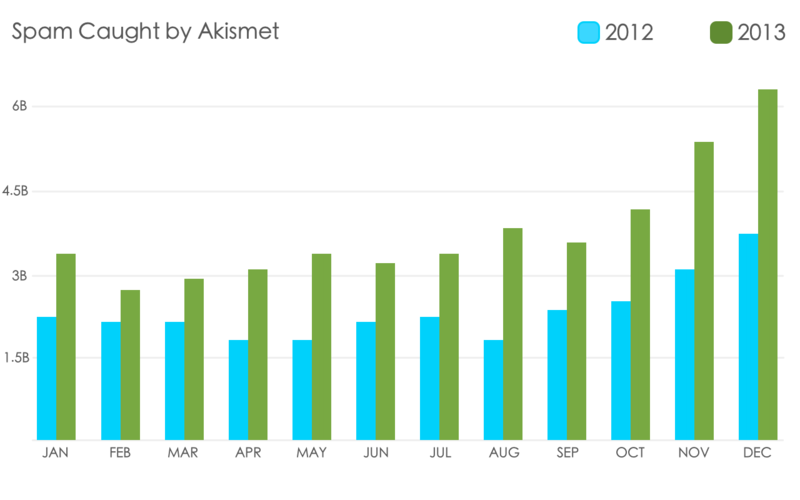 As 2013 draws to a close, we at Akismet would like to let you know just what we’ve been up to — and, of course, wish you a very happy holiday season. We reached an incredible milestone this year in catching our 100-billionth spam comment. And we’re already fast approaching our 115-billionth. On average, we are currently catching around 200 million spam comments every day, which is about 80 million more than our daily average this time last year. That’s over 8,000,000 per hour, or over 2,000 per second. For the year, we averaged over 120 million spam comments per day – a year-over-year jump of over 50 million. On December 21, we set a new record zapping 245 million spam comments in just 24 hours. While spam themes and schemes are always changing, knockoff fashion-goods spam (which we talked about in last year’s post) dominated 2013. Even more troubling is the rising trend of these spammers using hacked sites to deliver payloads. You may have seen these before, where links point to individual pages that include an extension (like “.asp”). We suspect that disenchanted SEO spammers are using this strategy in response to new policies by Google. Instead of simply posting comments with links to their own sites, they’ve moved to hacking vulnerable sites and launching buffer pages. Since the launch of Google’s Penguin 2.1 back in October, we have actually seen a significant increase in daily spam averages. Beyond our usual spam fighting activities, we have also started reaching out to other UGC services to see where, based on our vast pool of spam data, we can help in identifying spam troubling their own communities. We hope to expand that initiative in the coming year, and include hosts in the conversation as well. In 2014 you can also expect more educational anti-spam projects (including webinars), more frequent and insightful blog content, enhanced support documentation, and an increase in developer-friendly initiatives. And, of course, even stronger spam protection.